Today I gave a talk at the 2005 SSP (Sponsors of School Publications) Spring Conference at Webster University in St. Louis, MO. There were several hundred high school students at the conference. 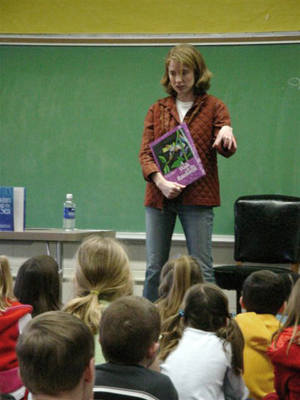 I was one of many local professionals volunteering our time to talk with the kids about turning writing into a career. When I showed up, I had no idea how many students would come to my session. And it had been a long time since I’d spoken with high school students. To my surprise, there weren’t enough seats for all the students who came through the door. These kids were really interested in what I had to say about publishing, since most of them worked on their school’s yearbook or newspaper staff. 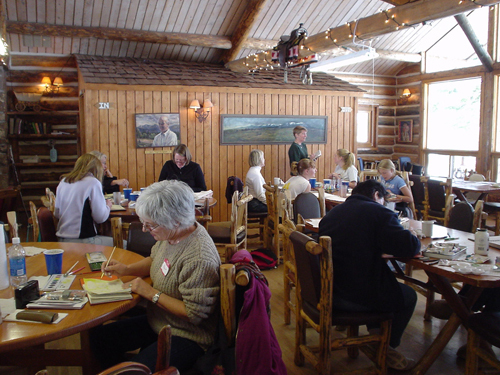 Some of them also had some writing projects going on the side, such as comic books, novels, or short stories. Some of them had already been published in magazines. They were also very curious about how I published my newest book Words With Wings. (I used a digital print-on-demand press called lulu.com.) It was a treat to work with such motivated students. Keep up the good work! So on my last day in Chesterton, IN, I visited Liberty Intermediate, and I had fun talking with 5th and 6th graders. They were really good listeners. One of my favorite questions about the writing process came from a very attentive girl sitting in the front row. We were talking about how you can write down story ideas in your journal so you have them ready when you go to make a book. This curious student asked what the process is for taking an idea from a rough journal entry to a finished book. I think that’s pretty insightful for 6th grade. 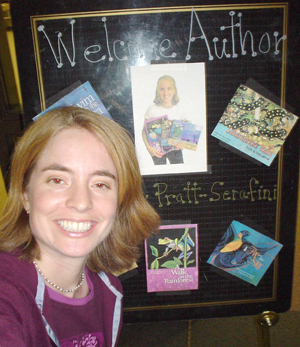 I talked about how my books are basically nonfiction, ecological stories. But over the top of the exciting science about cacti or salamanders, I like to add a layer of fiction. The human characters and their adventures are made up. So I could use my journal to record science facts, or I might pull an interesting adventure or character from my journal for use in the fiction part of the story. Some of the experiences that happen to the characters in the story actually happened to me. Thank you, Liberty Intermediate! Keep up the good work! Today I visited Brummitt School, and was happy to discover that Miss Cleveland, the new Media Specialist, had actually found my website when doing a graduate project. That discovery led to this whole week of visits. I love how full of energy she is. The K-4 kids at this school were all working on journal projects of their own, so I had fun talking with them about how anyone can start a journal. That’s how I practice my writing and drawing skills when I am not actually working on a children’s book. Thank you, Brummitt School! Today I had a great time visiting Liberty Elementary. 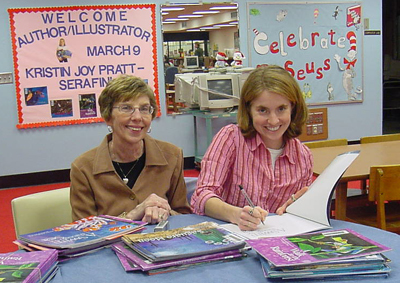 This is a photo of me signing books, with Linda Mapes, the media specialist here at Liberty. She was nice enough to set up this whole author visit trip to the Chesterton area. These kids were all working on their own young author projects so they could really relate to what I had to say about the book-making process. At this point, they are in the rough draft phase. Mmm, yes, editing. Not my favorite. But we talked about how you have to love your idea enough to make it the best it can be. I think they understood that. Mrs. Mapes took me out for a nice lunch in the middle of the day, and I signed books in the library afterwards. Thank you, Liberty Elementary! Today was my second day in Indiana, and I got to visit Yost School. This is also a K-4 school, and this time I spoke with 2 groups before lunch and two after. It was interesting to hear what questions they had, and for some reason there were a couple of new questions that I hadn’t been asked before. After speaking with student groups for more than 12 years, you’d think I’d have heard everything! One student asked if art supplies are expensive. Yes. (But tax-deductible!) Another asked if I ever have brain farts. Well, I try not to let that happen in public, and that led us into a discussion about keeping journals. That’s how I avoid those pesky brain farts, or writer’s block. 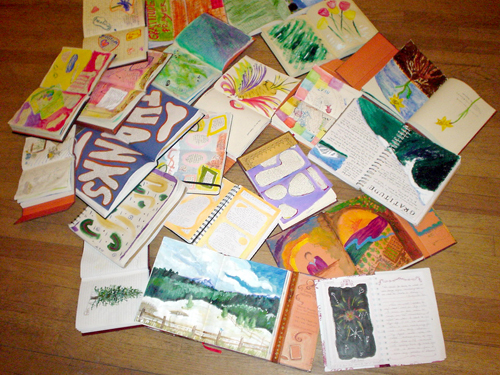 I practice my art and writing in my journal, and that’s also where I save up all my story ideas so I don’t forget them. I hope the students had as much fun as I did today! Oh, and I also have to thank the teachers, and especially Mrs. Borrelli, for putting together such a tasty lunch, and for welcoming me into their school! (And now I love fruit pizza!) Thank you, Yost Elementary! Hello from Indiana! I am visiting 4 elementary schools and 1 middle school here in the Valparaiso/Chesterton area this week. So, yes, I will be here through Friday. I am happy to say that the first day, at Jackson Elementary, went very well. I spoke with the whole school (K-4) throughout the day, and it was great because they are getting ready for their Author Evening on Thursday. That night, every student will have a piece of writing on display for parents and teachers to see. So they could really relate when I talked about how many times I have to edit my manuscript. Mrs. Riggers, the head librarian, took me out for a marvelous lunch, and we had a chance to talk about some of the neat ways this particular school is celebrating reading and writing. I was also interviewed and photographed by the local paper. What a busy day! (I hope I don’t get snowed in tomorrow.) Thanks, Jackson Elementary! Keep up the good work! Happy Read Across America Week! 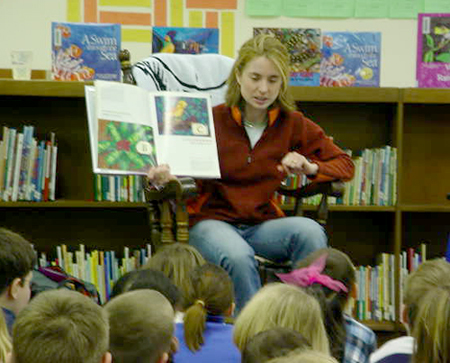 To celebrate Dr. Seuss’s birthday this year, I spent the day visiting the Dewey Street Campus School in Troy, IL. It’s a 3rd-5th grade school full of kids who love books. Lucky me. I drove over from St. Louis in time to meet the WORMS for breakfast & talk about books before school. 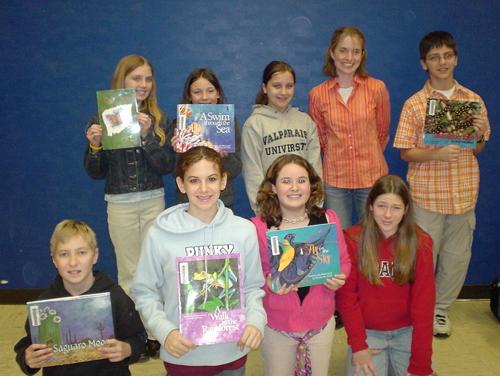 WORMS is a group of 3rd & 4th graders that gets together before school to read for half an hour once or twice a week. They study different authors and this week they were reading my books. When I asked if they had any questions, about 40 hands went up. It’s great to work with kids who are so excited about reading. If I was in 3rd grade, I would have loved to be a WORM. When school started, the students had prepared a special presentation that included poetry, songs, and a game of jeopardy with questions from my books. It was great! Then I spoke with each grade individually and signed books at the end of the day. 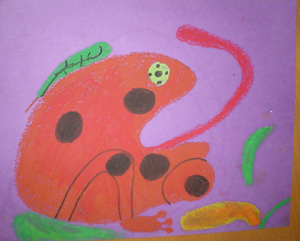 It’s wonderful to work with kids who are so motivated to write and draw. Thanks, Dewey Street Campus!